Truth by Kbaig: Pakistan’s Efforts for Normalization of Relations with India & her Response with Blame Games!!! Pakistan’s Efforts for Normalization of Relations with India & her Response with Blame Games!!! When Banglore Gwahati Super Express was pulling into Chennai Railway Station on 1st May 2014 at 07:30 AM, two explosions went off in two of its bogeys. Casualties included one woman dead and fourteen injured. Indian government preferred silence in this case. However, Tamil Nado Police Chief claimed to have arrested a Sri Lankan citizen named Zakir Hussain and blamed ISI. He also claimed that a case has been registered against Amer Zubair Siddiqui, Visa Councilor of Pakistani High Commissioner in Sri Lanka. He alleged that ISI is using Muslim majority areas in Sri Lanka and Pakistani high commission is facilitating entry of agents into India. Tamil police chief also alleged that Zakir Hussain has been in and out of India several times. He has recorded videos of Israeli and US consulates in Chennai for ISI. This time he was tasked to gather information about Indian military installations in Tamil Nado. A storm of propaganda kicked off in Indian electronic and print media as usual. However, Sri Lanka was also made a target this time. So called members of South Asian Analyst Group (SAAG) (majority of these are ex-employees of RAW), are at the forefront. Editorials and articles were published and propaganda still continues. These members of SAAG has also been involved in fomenting terrorism in Sri Lanka. Mr. Hari Haran, an Indian army retired Lieutenant Colonel, who has commended elements of RAW in Sri Lanka from 1987-1990 in the garb of Indian peace enforcing force. 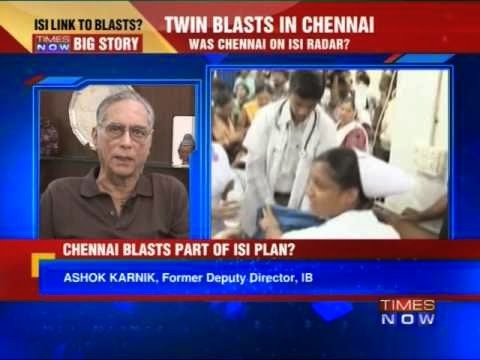 In his article titled ‘who planned Chennai bomb attacks, alleges that Pakistan Army, ISI and Lashkar-e-Taiba are involved in these terrorist incidents. 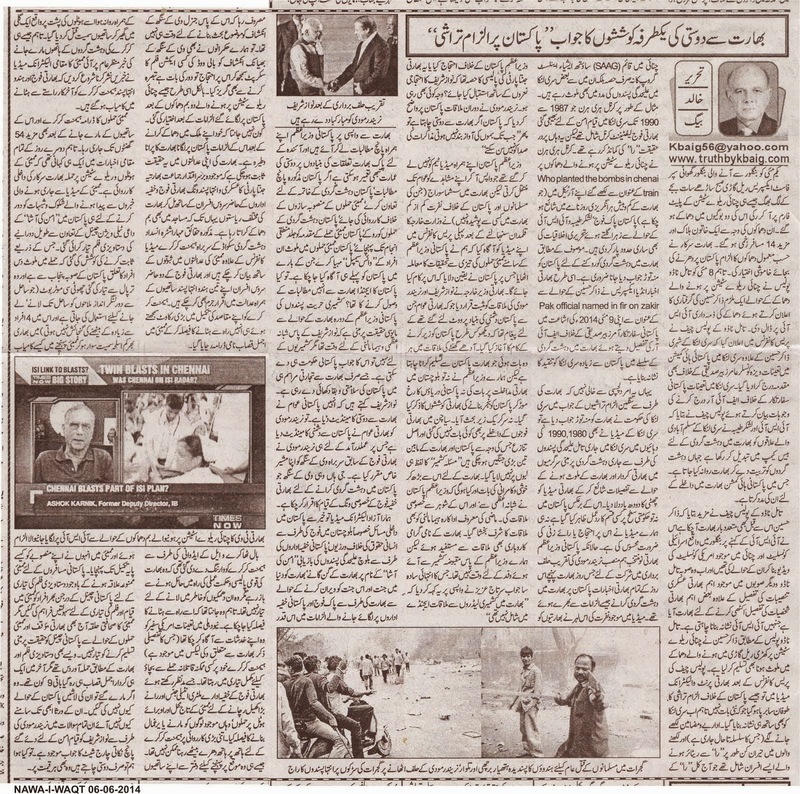 This article was published in all major English Daily Newspapers. The writer has disregarded every moral norms of journalism. In an article published in Indian Express titled ‘Pakistani official named in FIR for Zakir Hussain’ published on 9th May 2014, has targeted Sri Lanka while giving details of Pakistani diplomat Amer Siddiqui. It is interesting to note that Sri Lankan media countered Indian propaganda effectively by referring to Indian role in Tamil Insurgency from 1980-1990 and their help to Tamil separatists in fomenting one of the bloodiest terrorism in the history of that country. On the other hand, no reaction came from Pakistani government and media. On the day, Pakistani prime minister was visiting India for oath taking ceremony of Narendra Modi, Indian media was full of allegations against Pakistan. Some Indians welcomed Pakistani Mrime minister with anti-Pakistan protests. Or it was on the behest of Bhartia Janta Party. Whatever was the reason, Indian prime minister made it clear to his Pakistani counterpart, “in the noise of explosions, voices of negotiation cannot be heard”. Pakistani Prime Minister travelled to India without a media team, hence no details and observations came to light in Pakistani media. However, Sushma Swaraj, arch enemy of Pakistan, briefed Indian media on details meeting between the two Prime Ministers. She claimed that Pakistani Prime Minister was pressurized for speedy investigations on Bombay attack. According to her, Pakistani Prime Minister assured to address all Indian demands in half hour long meeting. Pakistani prime minister did not raise the issues of Indian involvement in Baluchistan, Sir Creek dispute, Indian intrusion in Siachen and Kashmir. An impression was conveyed by Indian officials that Pakistan is being brought under Indian influence as promised in general elections by BJP. Indian media was very happy over visit arrangement. Pakistani Prime Minister met Shabana Azmi, her husband, Indian actress Hima Malini and members of Indian business community. He didn’t spare time for meeting with Kashmiri delegation. Sartaj Aziz, advisor to Pakistani Prime Minister, had only one exucse say that meeting with Kashmiris was not on the agenda. 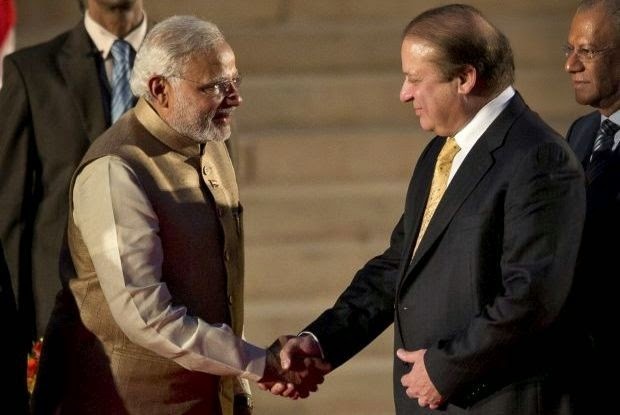 Pakistani Prime Minister came back from India with five Indian demands related to Bombay attacks. It seems that agenda of visit was to receive these baseless Indian demands. Hopelessness expressed by Kashmiri leaders is real and justified. Pakistani prime minster considers progress of Pakistan in improved economic relations with India! He has ignored BJP and Narendra Modi’s election campaign based on anti-Pakistan venom. Narendra Modi has appointed ex Indian army chief, V K Singh who has been heading Anti-Pakistan Wing in Indian Secret Agencies. Our ‘independent media’ has only time for alleged atrocities by Pakistan Army in Balochistan, missing person case and ‘Aman ki Asha’ with India, they have no time for appointment of V K Singh as security advisor to Indian prime minister. Our leaders also willfully ignored revelations of V K Singh and his anti-Pakistan role. Indian government is well known in orchestrating terrorism on its own people in order to malign Pakistan. Facts unearthed in Indian courts and Hemant Kurkuray are case in point. 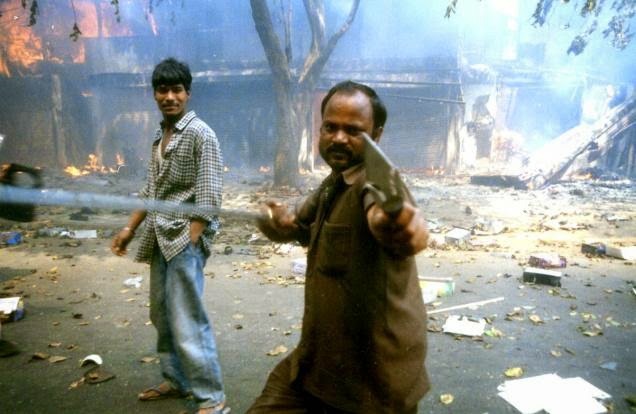 Extremist Hindu activists aligned with BJP and likeminded Indian army officers have been awarded punishments in courts for bomb attacks on Indian citizens and mosques. 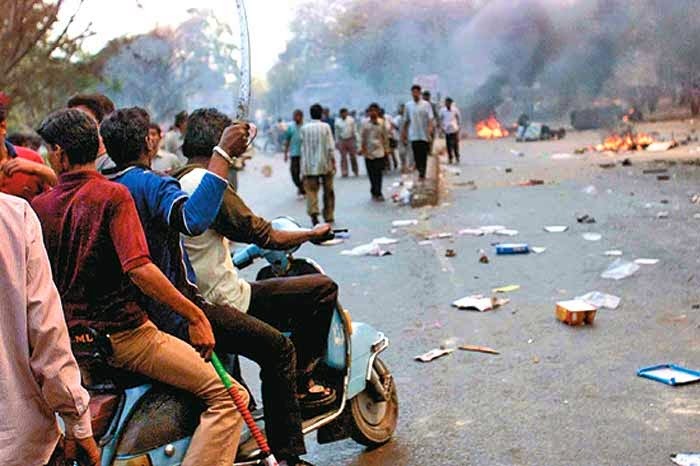 To remove Hemant Kurkuray, Indian officer in anti-terrorism squad, Bombay attacks were staged. Bal Thakray and LK Advani had threatened Hemant Kurkuray to remain away from Indian national and security policies. He knew that Military Intelligence and RAW has decided to remove him from the anti-terrorist post. He was always ready to face attempt on his life. Hemant Kurkuray had expressed his opinion to US Ambassador to India (details are in Wiki Leaks). Attacks on Taj and Obroy Hotels in Bombay were staged to draw Hemant Kurkuray into the scene. When his team reached the scene, he along with his colleagues was murdered in a back street. Bombay media reported that Indian secret agencies had at last succeeded in removing Hemant Kurkuray from their way. To subdue this vital media report, India media carried anti-Pakistan stories next day. A proponent of ‘Aman ki Asha’ TV Channel went at length to cover up involvement of Indian government and agencies in Bombay attack. A long documentary was aired on Pakistani private channel alleging that ten individuals from Pakistan intruded into Bombay via a collapsible boat (that could only accommodate four persons) with all their lethal gear. Bombay had been ‘no go’ area for Pakistanis. However, the media team from the private channel was accommodated in Bombay and given all facilities. But, Bombay media is still apprehensive about involvement of Indian government in engineering the whole event. No circumstantial evidence has been able to convince our leaders of BJP’s anti-Pakistan policies!!! They seem to be all out to Indian friendship at all costs.